On January 16, 2018 at approximately 8:41 pm, three Benson County police officers responded to an animal complaint at the home of Clayton Police Captain James "Richie" Herring. 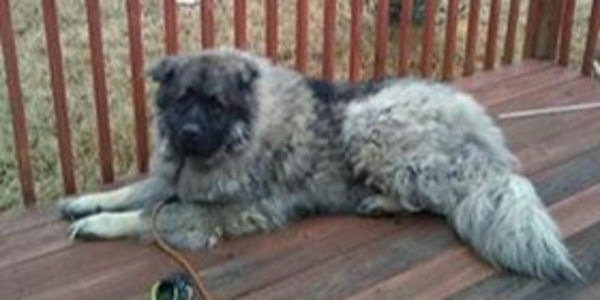 Herring had fatally shot his neighbor's dog, a majestic and gentle Caucasian Shepherd, four times. He alleged that the dog was aggressive and that he was in fear for his and his children's safety. Photographic Evidence illustrated below, however, demonstrates that Wakoda was assaulted on his side of the fence, in his own backyard, and that the police version of events are blatantly fabricated. The officers wrote up their report attached here, and ended it with "case closed." Benson police are also withholding a video recorded by Herring which they allege shows that Wakoda was "growling and snarling," acting "aggressively," and "charged" through a fence that separates the properties toward the off-duty cop. All parties agree that the fence was damaged. If Wakoda had "charged" through that fence toward Herring, his blood would have been on the cop's property. It was not. The only trail of blood left by the dog started in his own back yard and led back to his own home where he likely tried to seek refuge after being shot by a trigger-happy off-duty cop. Eleventh Hour for Animals filed an open records request with the Benson Police Department this morning to obtain a copy of the video in question. Herring is a public servant and the community has a right to see the exact circumstances under which he chose to reach for his firearm and use deadly force. The Johnson County District Attorney's Office has declined to press charges against James Herring. And now Wakoda and his family need your help. This petition is intended to compel the District Attorney Susan Doyle to re-open this case. Please sign and share throughout all of your social media networks. We are demanding that James Herring be held criminally accountable for murdering this gentle and beloved family dog and police officers involved be investigated and held accountable for covering up this cold-blooded murder to protect one of their own. A badge gives no one a right to murder at will and we must never allow the public trust to be betrayed when police officers choose to protect their friends rather than uphold the law. Full story , links to police reports & photographic evidence may be viewed HERE.